CITY OF WESTLAKE, Fla. – (JANUARY 9, 2018) – Minto Foundation, Inc., the charitable arm of residential developer Minto Communities, donated $75,000 during a check presentation to Habitat for Humanity of Palm Beach County (HFHPBC). The donation will help further the successful partnership between the nonprofit and the Weitz Construction Academy at Seminole Ridge High School. To date, the partnership has produced six homes for families in need and has provided meaningful vocational education to approximately 700 students. 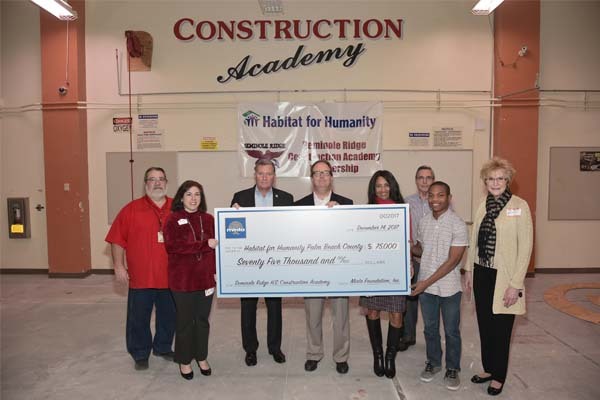 Distributed over two years, Minto’s donation will directly fund critical homebuilding supplies such as wood, screws and drywall for the Academy’s seventh house, none of which are provided by the Palm Beach County School District. The Weitz Construction Academy’s program addresses two important needs in the community: decent and affordable housing and the need for incentive-driven educational programs that encourage students to graduate. Each year, the Academy engages approximately 175 students to construct a three-bedroom Habitat Home as part of a four-year construction training program. The students build various pieces of the home on their campus which are then transported to the actual home site where other volunteers finish the job. “Minto is happy to support a program that aims to develop quality talent for our industry and one that many of our future residents in nearby Westlake may be able to take advantage of,” said John Carter, Vice President of Minto Communities. In October 2017, Minto debuted Westlake, a 3,800-acre master-planned community located approximately one mile from Seminole Ridge High School in the newly created City of Westlake. In addition to the $75,000 donation, the homebuilder donated 4.5 acres of land to Palm Beach County for a new high-tech fire station and has committed $25 million to expand and beautify Seminole Pratt Whitney Road which bisects the City of Westlake. Minto also created a workforce housing framework with the City of Westlake that provides down payment assistance for qualified homebuyers. Minto also offers a Welcome Heroes discount program with teachers, firefighters, police officers and service workers in mind. Located in Central Palm Beach County, Westlake blends residential, commercial and recreational elements into a vibrant new city. The Westlake Town Center will be a comprehensive retail district with an eclectic blend of national and local retailers, wide sidewalks and public spaces that host a lively calendar of programming and events. The community will feature an aquatics center with lagoon-style pool, tower slide and splash pad, plus an adult pool with swim lanes and shade cabanas. Expansive recreational lawns offer spaces for picnics, games and events. Additional amenities include an adventure playground, dog park, sports courts, pump park and multi-purpose building.